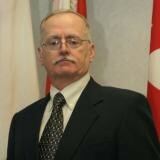 Barry MacDonald joined the Canadian Armed Forces in 1971 and was commissioned, as an Intelligence Officer, in 1994. He has served as an intelligence professional since 1978 and has served as an intelligence analyst, manager, trainer, assistant attaché, staff officer and geospatial intelligence leader. His assignments have spanned the full range of tactical, operational and strategic positions in Army, Air Force and joint headquarters in Canada, the United States, Cyprus, and Europe. He served as the Senior Intelligence Officer for Fighter Group/Canadian NORAD Region (CANR) responsible for delivering the full range of intelligence support to the CAF Fighter Force. In 1997, he became responsible for the provision of imagery and imagery intelligence support to CAF operations. This included all elements of the CAF as well as other government departments and included major missions such as Operation ALLIED FORCE. As Future Capabilities and Change Management Officer for the CF Joint Imagery Centre (CFJIC) he was responsible for managing the implementation of a new generation of digital exploitation technology. He also developed the Concept of Operations for a Deployable Imagery Support Team (DIST); forming and commanding the first DIST deployment in 2002 and proving the concept for what is now an established operational capability. Barry has served as CF national coordinator for Measurement and Signatures Intelligence and, after promotion to Lieutenant-Colonel in 2010, Deputy Director of Geospatial Intelligence, responsible for Governance and Partnerships responsible for managing Canadian Forces geospatial intelligence relationships both domestic and international. He also established and led the CAF’s J2 Targeting Branch during Operation MOBILE/UNIFIED PROTECTOR. He is currently Managing Director of Hyperion Consulting Services Incorporated which provides a full range of intelligence, geospatial intelligence and security services. Check out the incredible speaker line-up to see who will be joining Barry.